Age-related macular degeneration (AMD) is the leading cause of vision loss and blindness in Americans 65 and older. But if you’re like most people, you haven’t heard of it. It’s even hard to pronounce. Because it’s so prevalent, it’s critical to watch for signs of this disease. Here is what you need to know. Dry macular degeneration is a chronic eye disease in which the macula, a portion of the retina that controls the central vision, deteriorates. Here’s how your eyesight works: When light enters the eye, it hits the retina, which lies like wallpaper on the back of the eyeball. Neural signaling from cells in the retina transmits the information to the brain allowing us to see clearly. If the macula degenerates, it cannot transmit visual signals to the brain, leading to blurred vision or a blind spot in the central portion of the visual field. A less common form of the disease, called wet macular degeneration, occurs when blood vessels behind the macula leak fluid, causing changes in central vision. Are you at a higher risk of developing macular degeneration? This disease occurs more often in those who are older and Caucasian. You’re also at a higher risk if you have a family history of macular degeneration. Other risk factors include obesity, smoking, poor diet, cardiovascular disease, and high cholesterol. Like most things, prevention is the best cure. To keep your eyes healthy, eat a mixture of fruits and vegetables, maintain a healthy weight and cholesterol level, quit smoking, and get some exercise. Remember, if it’s good for your heart, it’s good for your eyes. People will AMD often first notice a gradual or sudden change in the quality of their vision. Some report that straight lines appear distorted. Other symptoms include dark, blurry areas or whiteout that appears in the center of your vision. In some rare cases, you may notice a change in your color perception. Some may notice a lag in the visual response rate when going from a bright to dim room or vice versa. No. 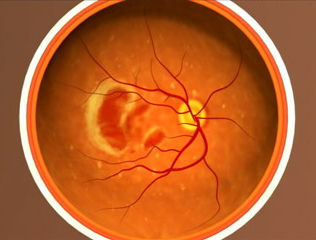 Dry macular degeneration is irreversible. However, it often progresses slowly and certain treatments or lifestyle changes may reduce the rate of progression. If you have dry macular degeneration, you must visit your optometrist annually. Your optometrist may recommend taking supplements, as high levels of vitamins A, C, and E, as well as zinc and copper, to reduce progression of the disease. Increasing your intake of omega-3 fatty acids and lutein may also help. As we live longer, more people are suffering from AMD. Many people wait until they notice vision loss to consult an eye doctor, at which point degeneration may have progressed to its moderate stages. If you have perfect eyesight, visit an optometrist once every year, especially as you get older. Optometrists examine the back of your eye, test for changes in the center of your vision, and use special imaging tests to observe changes in retinal structure or blood vessel integrity. These and other tests will help catch AMD and other eye health issues as early as possible.